Image 1 shows a region on Mars called Emmenides Dorsum, a high flat plain about 1000 km southwest of Olympus Planitia. The many long, needle-like features are yardangs that have been cut into an easily eroded (possibly sedimentary) unit. There are several small buttes and mesas that are erosional remnants, indicating the level of a former surface that has since been almost entirely stripped away by sand abrasion. A shadow measurement from one of the buttes indicates that ~450 m of sediment has been removed from this surface. Some of the mesas have a circular shape, suggestive of former craters. This indicates that the former high surface remained uneroded long enough for a few craters to impact it. Image 2: The Lut Desert, Iran. The image is a Digital Globe image from Google Earth. To find this location in Google Maps type the following coordinates into the ‘Find…’ bar and display the ‘satellite’ image: 30° 35′ 38.78″ N, 58° 16′ 0.25″ E. You may need to zoom out to see the image. 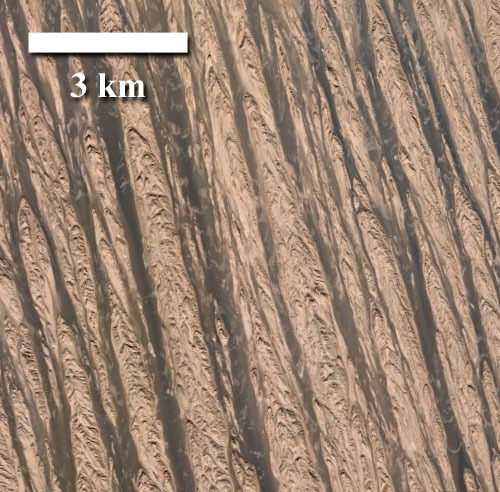 The second image shows yardangs in the Lut Desert of Iran. These yardangs are of comparable size to the martian yardangs in Image. 1. The dark material in the lanes between the yardangs is sand that is traveling downwind to a sand sea south of this yardang field. In this case, the sand that has eroded the surface is still present and actively changing the landscape. In the martian case, the sand may be long gone, reflecting an ancient climate regime in which winds were strong and sand was plentiful. El-Baz, F. and others (1979) Eolian features in the Western Desert of Egypt and some applications to Mars, J. Geophys. Res., 84(B14), p. 8205-8221. 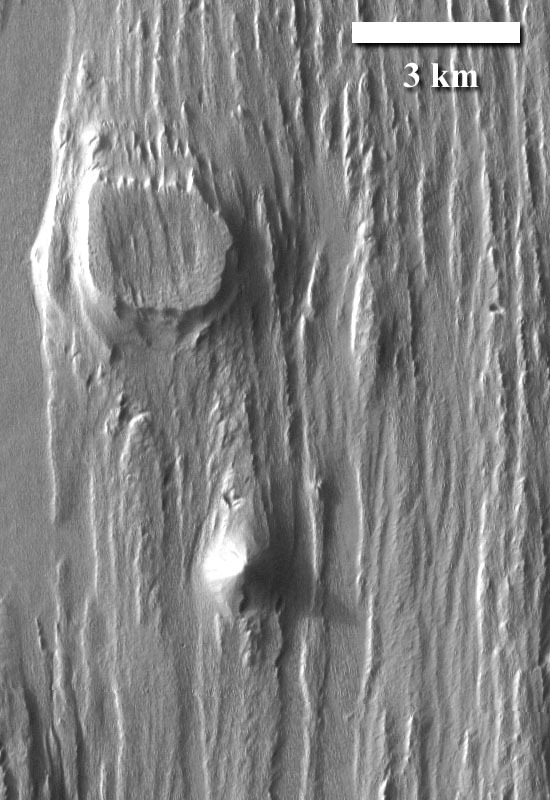 Ward, A. W. (1979) Yardangs on Mars – Evidence of recent wind erosion, J. Geophys. Res., 84(B14), p. 8147-8166.